If you're brain says "Charger" but your wallet says "used car," the 2011 Dodge Avenger may be your knight in shining armor. Its bold styling, great handling and affordable price will satisfy both your enthusiast and economical sides. 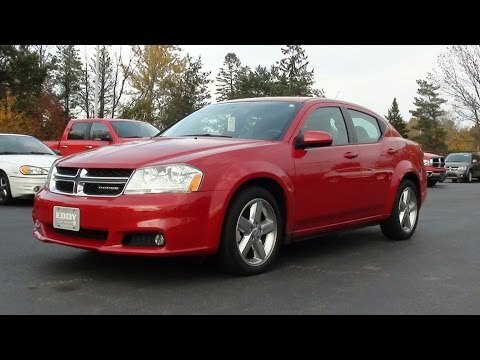 Summarizing my 2011 Dodge Avenger. There is not really any major issues I have with my car if there are issues it is because I do not keep up the maintenance how I should, I have had my car of 2 years and only problems I have had with the car is the engine which the dealership got fixed because I didn't have the car more than 60 days before the engine started to mess up but every since it is been fixed I haven't had major issues with my car, just regular maintenance issues, windshield wipers replaced every now and then, tune up, oil change just the basic needs of a car. I am not satisfied with this vehicle. I feel that the car interior is not large enough to accommodate slim fitting car seats, which is a very important thing for me. Also, it is starting to display some issues with chugging when going up hills, along with electrical issues. It is comfortable if you are sitting in the front seat but again the backseat is a little small if the front seats are in the middle setting for how far back they are. Also, the trunk has stopped popping which is very inconvenient for grocery shopping as well as trying to get our stroller around. The mechanical up keep to keep it running smoothly is not worth it. I really enjoy the ride of the car. The sound system works well and makes for an enjoyable ride. There has, however, been several mechanical problems. The air conditioning has been broken on three different occasions. The interior of the car is nice and stylish. I enjoy the spacious trunk space! Like most Dodge vehicles it has a fast and powerful engine. I am not the biggest fan of the style of the exterior of the car. Overall it gets me from one destination to the next and has only given me a few troubles.